We’ve got a do-it-yourself kit for forming an LLC in Alaska that you can purchase for $34.95 by clicking the button shown below. The application to reserve a business or entity name costs $25. The reservation is valid for 120 days. It is non-renewable. Put in the description of your business activity. In the example, I put wholesaling to mining companies. As an LLC, you can simply put in the words “any lawful” if you choose. 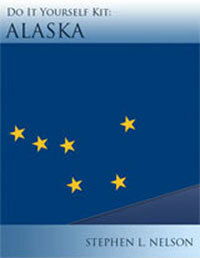 Alaska wants to know the name and contact information for a real person within the state of Alaska who the state can contact if it has questions or concerns about an LLC’s operation or if legal documents need to be served. The registered agent may be either an individual resident of Alaska whose business office is the same as the registered office, or a domestic or foreign corporation authorized to transact business in Alaska whose business office is the same as the registered office. If you have a PO Box, you will also need to put in your physical address. Accordingly, enter your name and address information onto the lines that ask for this information. If you have no date to dissolve your LLC, simply check the box after “the duration is perpetual.” If the duration is not perpetual, list the latest date that the LLC will dissolve. If you are using a manager to manage your LLC, then you will need to check the box in Article 5. In our example, John C. Smith, the owner, will be managing the LLC so the box is left blank. You need to both print and sign as the organizer of the LLC. You will also need to date the form and provide a contact name and phone number to resolve any questions with the form. Processing lead times vary, but in general, it takes several weeks to get your LLC certificate back from the Secretary of State’s office. You can expedite your filing by enclosing an extra $150 fee.